Our last interview for the Beauty and the Beast press junket was with Audra McDonald (Madame Garderobe) and Gugu Mbatha-Raw (Plumette). They are two of my favorite characters from the film and such remarkable women to interview. It was so interesting learning more about their roles and why they wanted to be a part of the new movie. 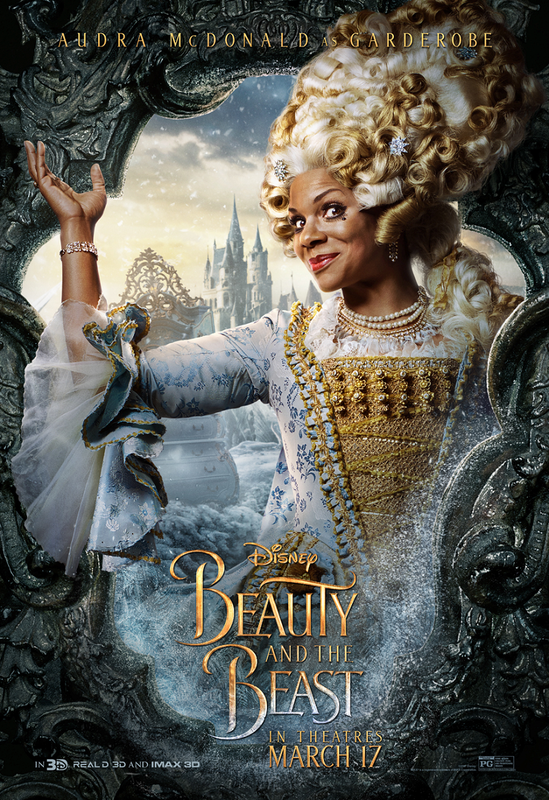 Gugu admitted she was obsessed with the original Disney film which came out when she was only eight years old. She would make her mom play the soundtrack cassette tape in the car on the way to dance classes. If you didn’t know, Gugu is an accomplished dancer. She squealed with excitement when she learned she got the part and very excited to work with such a phenomenal cast. Audra is an amazing singer and credits her parents for it. She said she was a very hyperactive, overdramatic child having a hard time in school. Her parents took her to a local dinner theater one night with a group of kids performing before the main musical. So, she auditioned for that when she was nine years old which set her on the right path. Disney has done such an incredible job with making this movie a diverse cast. Gugu said the director, Bill Condon, actually had the vision to make it a diverse cast. It’s a fabulous cast! Disney does a great job of representing the entire world. Audra has two of her own children, a sixteen year old and four month old, as well as two step-sons. Her kids were very excited to hear she was working on the film, especially with Emma Watson. Audra said it really thrilled her too because Emma is such an incredible role model for her daughter. Audra and Gugu’s roles are both live-action and computer-generated (CGI) characters. Plumette is a beautiful feather duster and Audra is a grand wardrobe. They had to do a lot of vocal work from singing to working on the French accent with the dialect coach. Audra was very impressed by Bill Condon’s leadership and how amazing he was as a director. She said the cast felt so safe with him. When she was doing her vocal work it was just her, the recording engineers and Bill. Both Gugu and Audra agreed that their costume designer, Jacqueline Durran, was incredible. Gugu said it was quite funny when she met her CGI character, Plumette. They had a feather duster on a stand so she could meet her ‘object’. Plumette is a very dainty creation, sort of like a flying dove and peacock. Gugu and Audra wore blonde wigs in the movie. Audra said hers was literally two feet off her head and so heavy. The dress was so big she couldn’t sit down and had a hard time holding her head up for long periods of time. The set carpenters actually built her a lean to! Gugu said she really hopes the audience gets swept up in the romance. The music is just so iconic. She loves the message that beauty is found within. Audra added that love conquers all and it’s also important to love yourself too. There’s something about the music in Beauty and the Beast that is so romantic. It hits you on an emotional level that you can’t not be swept up in it. It transports you.